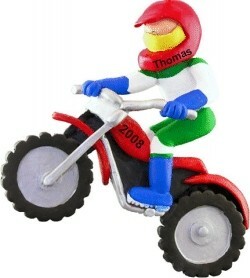 Your hard-riding dude will love the dirt bike racer personalized Christmas ornament that is as stylishly cool as it is bright and colorful. These hobby ornaments personalized for the recipient are great gift ideas for casual riders, trick riders and those that race competitively. Show him you like his riding style with the dirt bike rider Christmas ornament personalized to be very special when received in our classic velvet gift bag.